The position of goalie in hockey requires a significant amount of skating. Goalies have to make quick movements across the crease so they can stop the puck, recover and then stop the puck again. Goalies also have to leave the crease to retrieve the puck and make passes to teammates to start the attack. The sharpness of each goalie's skates depends on the style played. The blades of all hockey skates -- including goalie skates -- consists of two edges and an area in between the edges called a hollow. The radius between the edges determines the depth of the skate blade. Depending on the style you play, you might want greater depth or shallower depth. The radius usually varies between 3/8 and 3/4 of an inch for goaltenders. The butterfly style of goaltending is one of the most popular techniques used by goalies at all levels of the game. In the butterfly style, the goaltender will often go down to his knees and spread his legs to cover the width of the goal and then bounce back up to a standing position and then hit the ice again to make another save. The constant up-and-down style of the butterfly goalie requires sharp skates to make it easier to dig into the ice to pop back up when the goalie is on the ice. A hollow of 1/2 to 3/8 of an inch is preferable for the butterfly goalie. 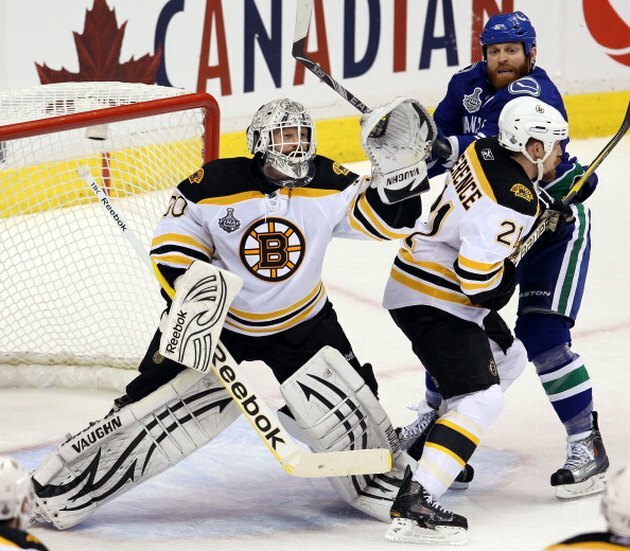 A goalie who holds his ground, challenges his shooter and does not fall to his pads as often is not going to want as sharp a blade as the butterfly-style goaltender. The stand-up goalie will do more skating than the butterfly goalie and will need to slide more in the crease. A duller blade will allow you to do more sliding and that would require a skate blade of 5/8 to 3/4 of an inch. A goalie who is playing regularly should get his skates checked to make sure the skate blades have the proper depth. The butterfly goalie who is constantly hitting the ice, digging in his edges and standing up again will need to make sure that his skate blade is sharp. A stand-up goalie won't need his skates sharpened as often. However, any burr or flaw in the skate blade will need to be ground out quickly so the goalie can do his job without impediment. Why Do Players Get Kicked Out in Faceoffs in Hockey? What Equipment Do You Need for Ice Skating?